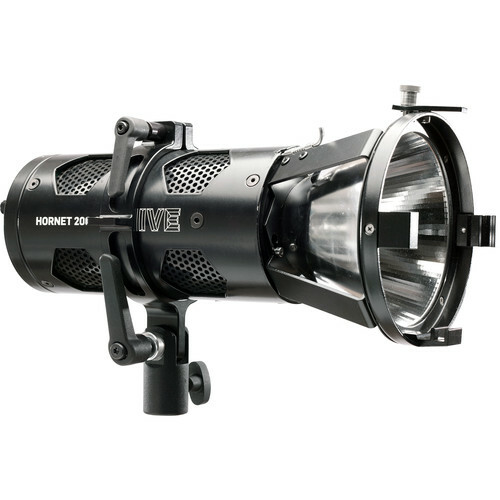 The Hornet 200-C Flood Omni-Color LED Light from Hive is a versatile 2.6 lb LED light source that measures 9" in length and 4" in diameter, making it a great choice for tight spaces with minimal support requirements. The flood reflector is a good choice for all-around use. Other reflectors, a Leko spot, and a Fresnel attachment are available separately. The 200-C has 0-100% saturation adjustment, 360° hue control, output control from 0-100%, and color temperature control from 1650 to 8000K for nearly infinite combinations for precise color balance. The 200-C uses red, amber, lime, cyan, blue, green, and sapphire LEDs instead of the traditional 3-color system to achieve a high CRI/TLCI of 98/97 to render colors faithfully with no output loss or color degradation. The Wasp 200-C uses just 150W to produce light output comparable to a 650-1000W incandescent. Its 9" length and multiple mounting points allow for easy rigging to cameras, drones, practicals, stages, and sets. The 200-C can run off a battery or universal wall power. The 200-C's functions can be controlled manually (locally) or remotely via your smartphone or DMX. The 200-C is 9" long and weighs 2.6 lb. Box Dimensions (LxWxH) 14.3 x 10.8 x 10.4"